« Another first for me…..
What makes a great latte? In my experience there is nothing like a coffee made in Italy. I don’t know what they do differently but the love and attention given to its creation definitely makes them unbeatable. However, we can’t spend all our time in Italy unfortunately, so we have to hunt high and low for an alternative – and I take great pride in my efforts at tracking down the perfect brew! 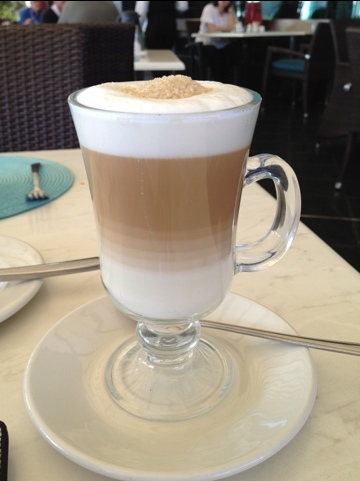 This morning the hotel made an excellent latte – I have observed that when served in a tall glass cup it should have a layer of milk at the bottom, a layer of espresso in the middle and a layer of foam on the top. The foam is perfect when you drop a spoon of sugar on it and it sits there for ages before dropping into the glass and mixing up the layers with swirls of coffee colours – a thing of beauty. Now simply stir, sit back and enjoy.